An earnest and insightful conversation around mentally incapacitated persons (MIP) and the management of their finances under the Mental Health Ordinance featured as the anchoring theme of a talk by DVC’s Terrence Tai and OLN’s Eunice Chiu on 25 March 2019. 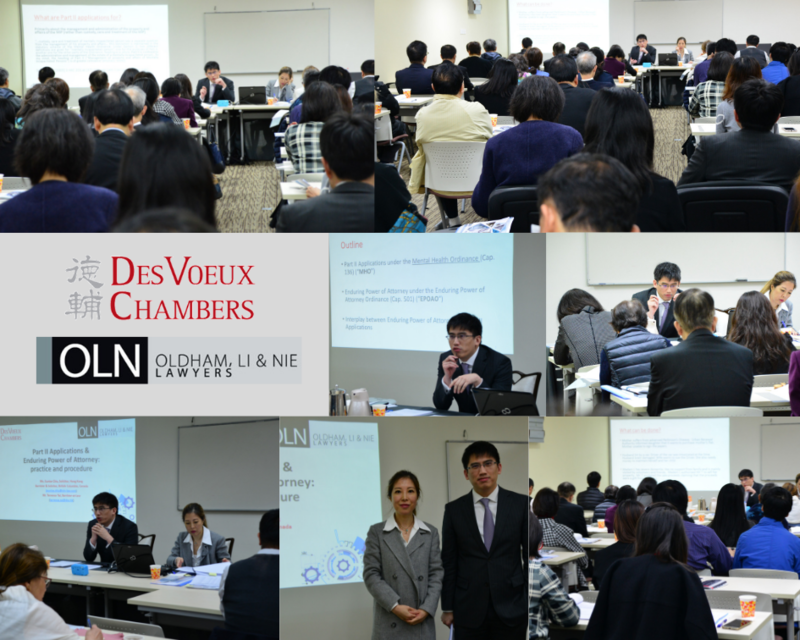 Over 60 attendees converged to find out more about Practice and Procedure associated with Part 2 Applications and the Enduring Power of Attorney in the context of MIPs in the CPD accredited seminar organised by LexOmnibus. Terrence provided a comprehensive overview of the 4 different stages of the Part 2 application including the pre-application, directions, inquiry and post-inquiry stage. He also deftly covered the court’s jurisdiction in determining the appointment of a ‘committee’ - emphasising that the court always considered what was in the MIP’s best interests, and clarifying that the process was inquisitorial, as opposed to adversarial. He peppered the talk with frequent references to case law. Terrence’s presentation was counterpointed by a detailed discussion delivered by Eunice on the Enduring Power of Attorney and the advantages that ensued including the efficiency of the mechanism as a way of administering the donor’s property and obviating the difficulty and distress usually endured by the donor’s family in connection with the donor’s financial affairs. The presentation was an informative one, interspersed with key practices and tips for solicitors and in-house counsel. It ended with an engaging Q&A session.